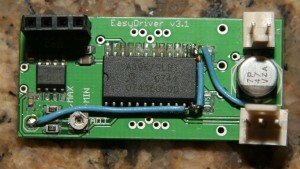 Brian Schmalz’s easy driver, offered by SparkFun is a nice little stepper driver. There are two major deficiencies however: It is hard wired to eighth step mode, and the ground pin is opposite the signal pins. I decided to fix these as I reassemble the extruder. The step mode on the A3967 is selected by pin 12 & pin 13. By bringing these pins low, we can select full step. This is achieved by clipping the pins from the pads and soldering a wire to ground – the same ground I wanted to route over to the signal pins. In order to seat the polarized header, I filed a pin slot and soldered the ground jumper. You are currently reading Retrofitting an EasyDriver at OoeyGUI.